The 2014 AmericanMuscle Car Show gave way to an amazing gathering of Mustangs, people, and events with the Roush Burnout Contest being one of the most talked about! Some of the sickest Mustangs in the country showed up to show what they are made of by laying down rubber and making a big smokey burnout. As you can see, there was no shortage of rubber available to be shredded. Brett “Big Schwag” Wagner MC’d the event and gave it a bit of his personality to make it all the more memorable. There were two main highlights from the show. The first being a newer 5.0L who not only made a huge burnout but also caught his Mustang on fire, creating a side show within an event. The second highlight from the event was a figure-8 thrown into the middle of a burnout by the winner of the event. 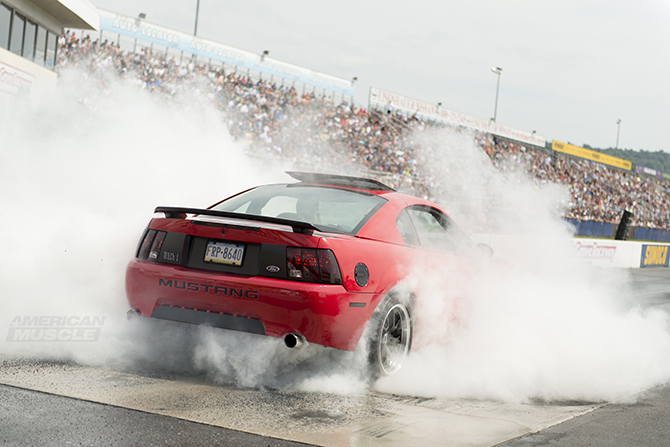 The Roush Burnout contest was a huge success, generating a lot of burnt rubber and white smoke. Roush made sure to hook up contestants with some swag for putting on such a large spectacle. The main takeaway from the video above is that Mustangs and burnouts go together like peanut butter and jelly. Which burnout was your favorite?